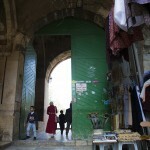 The second western wall gates of Al-Aqsa Mosque, from the north after the gate of Bani Ghanim. A huge door airtight construction. Rectangular entrance, a height of 4.5 m, and renovated in the reign of King holy Issa 600 e-1203m. 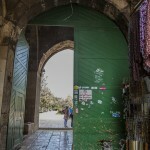 The name of this place is famous for the proportion of the Two Holy Mosques headmaster, and it was a function in Mamluk time and It is given to those who oversees the Al Aqsa Mosque in Jerusalem and the Ibrahimi Mosque in Hebron. 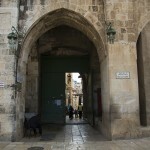 It was cold by that name since this beholder was staying in nearby buildings for this section in the Mamluk period, it is also renowned as the “door of the Council”, above this gate is Manjakiyya school, which was the headquarters of the Supreme Islamic Council, during the British occupation, before they turn to the headquarters of the Department of Islamic Waqf in Jerusalem now. 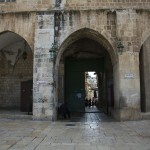 It is one of the Al Aqsa Mosque three doors that do not open in front of other worshipers to perform the Isha and Fajr prayers in Al-Aqsa Mosque since the beginning of the Zionist occupation of the holy mosque. this door witness the entry of the first funeral for one of al-Aqsa Martyrs Massacre III (Al-Aqsa Intifada) to pray on him in the Al Aqsa Mosque on 29/9/2000 m, the martyr ( Osama Jeddah) / 20 years, one of the residents of the African quarter which is located outside the gate. (They are the descendants of Africans Mujahedeen who came to liberate Jerusalem from the Crusaders, and they lived next to the maximum besides this gate). 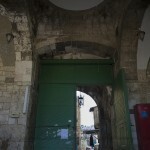 Also it displays the door to several attempts by the Zionist occupiers to close it after several clashes with the people of the quarter and Jerusalem in general.